I posted recently (here) on two decisions concerning Chagossian refugees in their long-running campaign to be re-settled in the islands from which they were evicted by the UK in the 1960s. The first was a claim for further documentation, the second an application for cross-examination of key Foreign Office witnesses on the basis of a Wikileaks document (read judgment and read judgment). And here is another skirmish in the same battle. In the first of the previous cases, in front of the First Tier Tribunal, the Chagossians failed to get some of what they were asking for, namely earlier drafts of a feasibility study in the possession of the consultants. The disclosed version of the study claimed that re-settlement of the Chagossians was uneconomic and impracticable. As explained before, this supported the FCO’s contentions that, though the evictions were unlawful, it was not practicable to remedy it now. Before the FTT, the consultants were content to release the documents to the Chagossians had the FCO agreed; but the FCO did not agree. On technical grounds, the FTT ruled that the FCO did not hold these documents, and therefore could not be compelled to produce them under the Environmental Information Regulations. One element of today’s decision of the Divisional Court concerned the Chagossians applying for disclosure of the same documents, not from the FCO, but from the consultants direct. A court in limited circumstances can order disclosure of documents from third parties who are not otherwise involved in the litigation, where (put shortly) it is necessary for the fair disposal of the claim between the main parties: CPR 31.17. Here, the Chagossians got such an order from the Court, without opposition from the FCO. A rather long way round to achieve what would have occurred if the FCO had agreed to the release of the consultants’ drafts in the first place at or before the FTT. As I pointed out in my earlier post, the Divisional Court was due to hear the Chagossians’ challenge to the designation of the waters around the islands as a Marine Protected Area, which prohibited all fishing. They said that this designation was motivated by a decision to stymie any remaining economic viability which the islands may have – the Chagossians’ traditional livelihood arose out of fishing. The main hearing of this challenge was due this week. The Court has now adjourned it, to be heard sometime in the New Year. 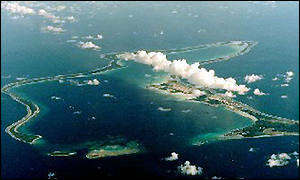 (ii) a further claim that the consultation on the MPA was flawed because the FCO did not reveal that it had undertaken to grant fishing rights to all Mauritians in BIOT waters as long ago as 1965; the Chagossians were now Mauritian citizens and could therefore exercise those rights; the consultation should have revealed this undertaking and the consequent fishing rights which the Chagossians derived from it. The FCO said again that this was an international law claim which the domestic courts could not rule upon. Indeed, Mauritius has brought arbitral proceedings against the UK in respect of the MPA, asserting that the MPA breaches those self-same fishing rights; in this case the tribunal is that set up under the UN Convention on the Law of the Sea, and the proceedings are still going through the written documents stage. The Divisional Court ruled on the merits of neither of these arguments, other than to say that they are at least arguable – though in the Article 198 instance, it reached that conclusion, despite not finding the Claimants’ argument “immediately persuasive” on an initial view. Roll on the spring, when this fascinating challenge comes to be heard. In the meanwhile, we need to keep an eye on the Chagossians’ application to Strasbourg, as well as the UNCLOS proceedings in respect of the MPA. So I suspect that this will not be the last of these posts. It is the Ilwa’s misfortune to be placed at the centre of the most strategic spot in the southern hemisphere.